Rob and Karen Hale make a transformational gift to Boston Children’s and an investment in the future of medicine. The Hale family’s historic gift, to be shared equally by Boston Children’s Hospital and Brigham and Women’s Hospital, is an investment in care and science and confirms Boston as an epicenter for far-reaching medical advances. Boston Children’s will name their future 11-story clinical tower in recognition of the Hale’s remarkable donation. Rob and Karen are prominent Boston-area philanthropists with deep ties to Boston Children’s. They both serve on the Trust Board and have headed up numerous fundraising events. Rob serves as chair on the Steering Committee for Boston Children’s Dream, Dare Deliver campaign. He is CEO of Quincy-based Granite Telecommunications, a leading communications services provider widely recognized for its humanitarian and philanthropic work in the community. In 2016 Rob chaired the record breaking Champions for Children, which raised over $9 million in one night, a first for Boston. The Hales have also rolled up their sleeves to help at the Yawkey Family Inn, Boston Children's housing for patient families. Rob and Karen have also provided for families through the Hale Family Center for Families—a cornerstone of Boston Children’s main lobby and the first, welcoming impression for so many who walk through our doors. 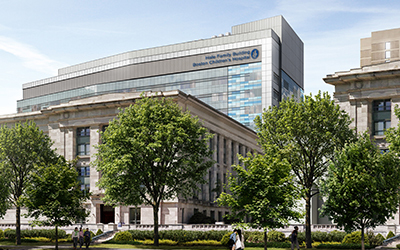 Now, their name will be synonymous with the groundbreaking innovation and enhanced patient care that Boston Children’s new building will make possible. For a full set of hi-resolution images, click here. The Hale family will name a new building designed to transform medical care for children and their families who face the most medically complex conditions. This will help Boston Children’s meet increasing demand from increasingly complex patients. The facility will include an expanded Heart Center, a state-of-the-art Newborn Medicine Center, and the world’s most advanced Center for Complex Surgical Solutions. The Hale Family Building will integrate care and facilitate collaboration across specialties to improve the outcomes of every child. And it will help the hospital care for the most basic, human needs, including the security and comfort of private rooms for all patients, and a significant increase in green and open space for healing and respite. Learn more about plans for this new building on the Transforming Tomorrow website. Dream Dare Deliver is Boston Children’s campaign, the largest for any children’s hospital, to reshape the future of pediatric medicine. Dream Dare Deliver will expand five centers of care and discovery at Boston Children's Hospital: heart, brain, newborn medicine, cancer, and orthopedics. Each is an area where we have deep capability in multiple disorders, a broad base of science informing care, and national and international reach in both convening scientific collaborations and attracting patients. Each presents exceptional opportunities to build on Boston Children's existing strengths in the service of speeding discovery and delivering new treatments. Many researchers at Boston Children's are also physicians, treating patients with disorders so complex they have to invent entirely new approaches. They imagine solutions that don't yet exist, assemble creative teams, devise new tools—and, in the process, redefine treatment.